- In hindsight, 113.9 may have been too tight of a profit/stop to take off 1/2 our position, but that's what my trading rules suggested. 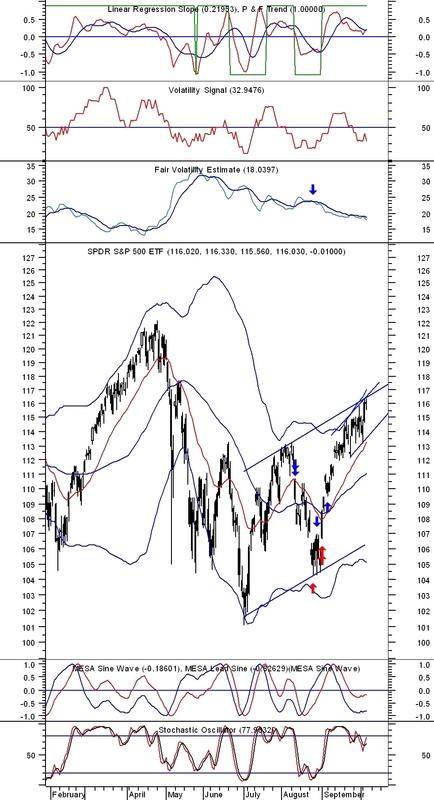 SPY has remained very strong, longer than most investors would have anticipated. My feeling is that if you have riden this tremendous run from start of September, now may be a good time to take some profits, but I would still maintain a bullish position. 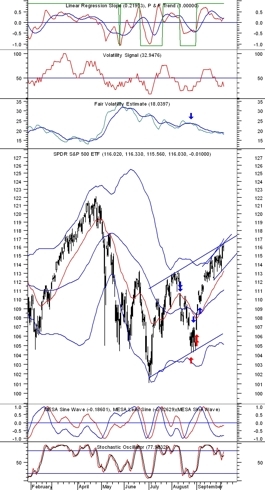 - Linear Regression Slope, FVE, and Stochastic Oscillator indicators are still bullish, while surprisingly, the Volatility Signal indicator remains in bearish territory. I'm moving up my 2nd profit/stop level to 112.8. -The FVE indicator has remained in a downtrend since 8/25, correctly instructing us not to have been long volatility all this time.